The Daintree Village is located about 12km upstream from the Daintree ferry crossing, situated on the southern bank of the majestic Daintree River. This unspoilt haven is set in the midst of some of the loveliest and most varied scenery in Far North Queensland. The surrounding hills and valleys provide a mix of landscapes, combining pristine agriculture pastures with tropical lowland rainforest. The Daintree River flows past the Village, and is home to many estuarine crocodiles. Beyond the Village are scenic drives along winding valley trails which follow the courses of the upper reaches of the Daintree and into the valleys of Stewart Creek and Douglas Creek. Here you will find a delightful mix of cattle country, tropical fruit farms, secluded retreats, host farms and areas of lush tropical rainforest. Daintree Village has a population of about 200, this includes the inhabitants of the surrounding valleys. The Daintree Village has an interesting history going back to early pioneer days. The Daintree River was only discovered by Europeans in 1873 when Scottish geologist and explorer George Elphinstone Dalrymple described the Daintree River as "the finest tropical river I have ever seen" and named it the Daintree in honour of his old boss Richard Daintree, who, at that time, was Agent-General in London and some time Government Geologist for North Queensland. Dalrymple’s explorations unearthed huge stands of red cedar which lead to the arrival of the timber cutters and a thriving timber industry, where loggers felled the magnificent large rainforest cedar trees for export. Between 1882 and 1932 the Daintree River was the only means of getting supplies in and out of the Daintree Village. Sailing ships used the river to transport goods between the town, Port Douglas and Cairns until 1933 when the road to Mossman was finally opened. Today the Village itself is home to around 100 people, it has a primary school of 15 pupils and a thriving farming (cattle and sugar) and tourism industry sustaining the town. The oldest building still standing is the Timber Gallery in Stewart's Street which was built in 1925. It is made from timber milled where the Daintree Riverview Lodge and Camp Ground stands today. Daintree Village hosts a number of local art and craft shops including handmade pottery, textile art and painting, local jams and produce, souvenirs and tropical clothing. There are also a small number of restaurants and cafes. The timber gallery, (open most days) is now home to many unique species of sustainable and other recycled timbers, to create their world famous vases, bowls and other natural works of art. The Timber Gallery is located next to the Big Barramundi al fresco restaurant in Stewart Street. Next door to Daintree Originals is Liz Bright's studio, gallery and workshop; step into this fantasy land and you will be whisked 'away with the fairies' as you walk through Liz & Ivan's delightful garden which leads the way to the studio. There are many river tours operating throughout the day, allowing you to appreciate the magnificent scenery and wildlife of the Daintree River. Some tours offer a short crocodile and wildlife-spotting experience, whilst other interpretive cruises cater for special interest groups such as birdwatchers, naturalists and photographers, and are operated by world-renowned experts in their particular fields. Cruises leave from the Village jetty and at a number of departure points along the Daintree River. A picnic is ideal way to enjoy the tranquility of this region, and to take in the magnificent landscapes, there is even a free electric barbeque at Pioneers Park in Daintree Village. Accommodation is varied in the Daintree Village, from deluxe bed and breakfasts to a private, self-contained holiday home and a world-renowned luxury eco resort. Red Mill House is well known amongst birding enthusiasts, and popular with guests who have a keen interest in nature, wildlife and conservation. Trish and Andrew Forsyth, the owner/operators of Red Mill House, are keen birdwatchers, and have prized themselves on excellent service, accurate information, varied wildlife and fabulous breakfasts. Red Mill House combines the charm of an historic Queenslander home, with all the creature comforts for a pleasurable stay. Four modern, spacious, ensuite rooms with wide verandahs overlook the extensive tropical gardens, meanwhile a two bedroom family unit is located in the original house. An excellent reference library and binoculars for loan, plus local maps and up-to-date sightings and tour advice combine to help guests make the most of their time in the Daintree area. Tranquility on the Daintree is a private retreat set on a secluded 450 acre private property, in the upper reaches of the Daintree valley. Perfect for couples looking to escape, families or groups of up to ten looking for a private getaway, you will have access to all of its natural wonders including lush tropical rainforest, hidden waterfalls, rainforest streams and abundant wildlife. Enjoy spectacular 360 degree views over lush farmland, the beautiful Daintree River, picturesque mountains and the World’s oldest living tropical rainforest. 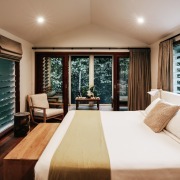 Daintree Eco Lodge & Spa provides a true rainforest experience. 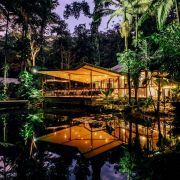 Situated in the World Heritage listed Daintree Rainforest, adjacent to the majestic Daintree River, the Daintree Eco Lodge has won numerous awards for its innovative architecture, site and location, world-class spa, authentic Aboriginal cultural tourism and eco-tourism. Featuring 15 quality rainforest villas nestled amongst the rainforest, guests will enjoy this wonderful healing environment. forest, riverine, estuarine, coastal melaleucas and beaches, attracts a large number, and large variety of birds. Stewart Creek Rd is a favourite walking track for birdwatchers in the Daintree, often up to 50 species can be seen on this walk. The Upper Daintree Road passes through farmland and rainforest, with a variety of habitats for birding. Some of the lower lying country has waterholes and wetlands, where you can spot water birds feeding in and around them. The Daintree River has been well-known as a birdwatching locale for many years. There are many options for birding cruises with specialist guides on the Daintree River, each visiting different sections of the river system. Target species include Great-billed Heron, Little Kingfisher and Black Bittern. 40-50 species in a morning trip is not uncommon. Birdwatching in Daintree is fruitful year round, however prime time would be October and the beginning of November, which coincides with the arrival of the last regular migrant species and before the real hot weather takes hold. Red Mill House has been well known as a popular birdwatching destination for many years. Owned and operated by Andrew and Trish Forsyth, two enthusiastic birders, they will happily provide you with good up-to-date information and advice. The extensive gardens of Red Mill House are renowned for Daintree birdlife. With a large natural pond and many fruiting and flowering rainforest and exotic trees, the garden creates a haven for many bird species, including Little Kingfisher, Wompoo Fruit-Dove and many more. Reptiles, frogs and butterflies abound in the garden and some mammals such as Spectacled Flying-Fox and Northern Brown Bandicoot are regular visitors. The best way to really appreciate this significant wilderness area is onboard a Daintree River Cruise. Cruises are provided in a small vessel which enables an intimate exploration of the river banks and wildlife in the trees and sky above. The River guides are local well informed naturalists and biologists and also keen bird watchers. There are a number of river cruise operators who depart from various locations along the banks of the Daintree River. Due to the river's isolation and legislation, saltwater crocodiles have flourished in recent years, so it is important not to step close to the riverbank, or stay within the confines of boats, and absolutely never swim in the river. The Douglas Shire Historical Society's heritage walk will guide you on a journey back in time to learn about the colourful history of Daintree Village. The walk will pinpoint historical sites and explain their significance. At a leisurely pace this walking tour should take half an hour, covering less than two kilometres. You can pick up a self guided walking map from any of the tour desks in the Village. George Elphinstone Dalrymple discovered the Daintree River in 1873. He named it after his friend, government geologist Richard Daintree. The long awaited Daintree Hall was built by Arthur Zillfleisch & Co. for the Douglas Shire Council in December 1956. Red Mill House was built by the Managing Director of the Daintree River Development Company, Alfred Lucas Hughes. He built this residence for his family in 1930. Lucas Hughes was responsible for the revitalisation of Daintree Village. He headed the company which built the Sawmill and the Butter Factory in the early 1920s. The Hash House was built around 1923 by volunteer labour to provide hearty meals for workers at the Sawmill and Butter Factory. Later the Wallwork family built a two-storey boarding house at the rear. Bushman's Lodge - Jack Maxwell the engineer at the Butter Factory around 1939, built this two-storey house. The original building on this site was the home of Eric Osbourne, the engineer for the first 10 years. The Sawmill was built in 1923 by the Daintree River Development Company to provide timber for a butter factory and houses for its workers. It closed in 1942 due to fuel rationing and lack of logs. The Butter Factory opened in 1924 and was the most northerly in Australia. Both factories were run on the same steam boiler. The Butter Factory won many prizes worldwide for its butter and became a co-operative run by the dairy farmers, they installed their own boiler. It closed in 1962 and a caravan park now occupies the site at the end of the main street of Daintree Village. The wharf was the heart of the town for 50 years. A steam winch hauled logs up the hill to the Sawmill and cream was landed for the Butter Factory. Cedar logs were floated down to waiting boats and launch services carried passengers and produce along the river until the road to Mossman opened in 1933. Daintree School opened in 1924. One-teacher provisional schools had operated in the area since 1899 but it was difficult to retain teachers in the harsh environment. The first permanent settlers in Daintree area were John, Archie and Gavin Stewart in 1879. John Whitehead Stewart took up Portion 57 across the river from the present township, he introduced the prolific Para grass for the settlement's pastures, and grew the first mango and mangosteen trees in the area. The first postal receiving office in the Daintree was opened on his premises. The Osbourne family arrived in the district in 1882. Frank Osborne came and took up land, working the cedar trade. He found Daintree a beautiful and diverse region, passing his appreciation of this pristine area down through the generations. Kenadon has been a cattle property in the Daintree Valley for over 100 years. The fifth generation still lives in the Daintree on this 350 acre property that surrounds the Daintree township. In 1980 the Steens purchased Jack Maxwell’s house, renovated it and opened a restaurant. They also opened the Timber Museum and gallery. Some of the cedar cutters’ original tools may be viewed in the Daintree Timber Museum & Gallery. Public transport is limited throughout the Daintree region, so we highly recommend hiring a vehicle and self driving. The Daintree Village is located one and a half hours north of Cairns and 45 minutes from Port Douglas. When you reach the signage indicating turn-off to the Daintree Ferry, do not turn-off! Instead continue travelling straight ahead for approx 10km and you will arrive into the Daintree Village.